Singer/songwriter and Love and Hip Hop Atlanta's reality show star K Michelle has released some new music, in mixtape format. I've listened to this mixtape countless number of times since it dropped and I must say that I am enjoying it. K Michelle remixed songs like Kirko Bangz - 'Drank in My Cup', Meek Mill - 'Amen', DJ Khaled - 'I'm on One', Miguel - 'Adorn' and Frank Ocean - 'Acura Integurl'. 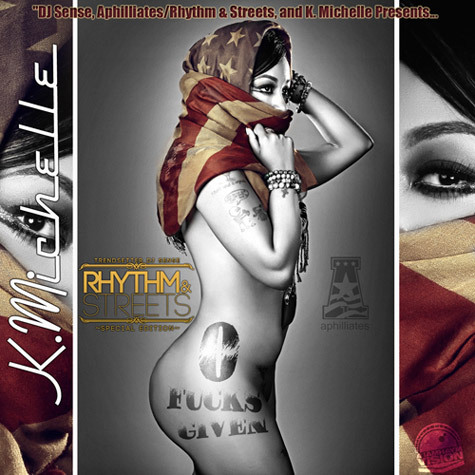 K Michelle certainly lives up to the mixtape name '0 F*cks Given' because she is going right in. In this new mixtape Michelle is very outspoken, talking about her son, her career, her ups and downs, men or shall I say a certain man (we should all know who) and everything else that women talk about. K Michelle can definitely hold a note, so no complaints. Download or Stream 0 F*cks Given below now. Tell me what you think about K Michelle's new mixtape.